This is another problem image that I’d had several goes at over the years and never came up with anything that I liked. I think it’s getting somewhere now, although I’m not sure it’s there yet. The problem has always been in balancing the tones. The light on the day was constantly changing as the clouds were being blown in front of the sun by the wind, and the hilly landscape meant that some areas were in shadow and others weren’t. 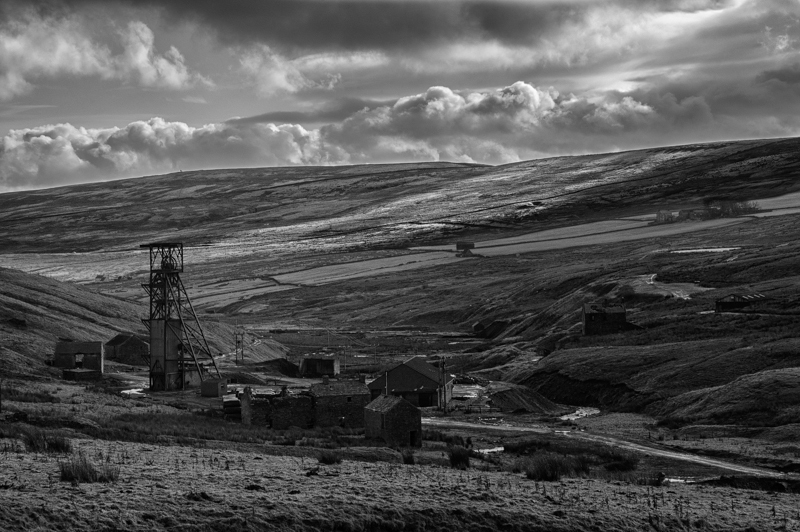 The photograph is about the derelict old mine and its position on the landscape, and using the tools in Colour Efex pro has enabled me to subtly focus attention on the mine, even though it’s only a small part of the sceen. It’s certainly an improvement on the previous iterations of the image, I’ll probably come back to it again when my skills are at a higher level to produce the definitive iteration! Rahter you than me! It was rather breezy when I went, and the entire thing was creaking and groaning like something out of a disaster movie. This is on my list to photograph next time I am up in that area.I have thousands of pictures of the UK mining areas above and below ground. Thanks Ant. I saw some pictures posted on Flickr of the place that were taken this week, it still looks exactly the same! No danger of it going away anytime soon it would appear.